I chose to wear the costume myself as I really get into the Halloween spirit by being creative and creating my own costumes. 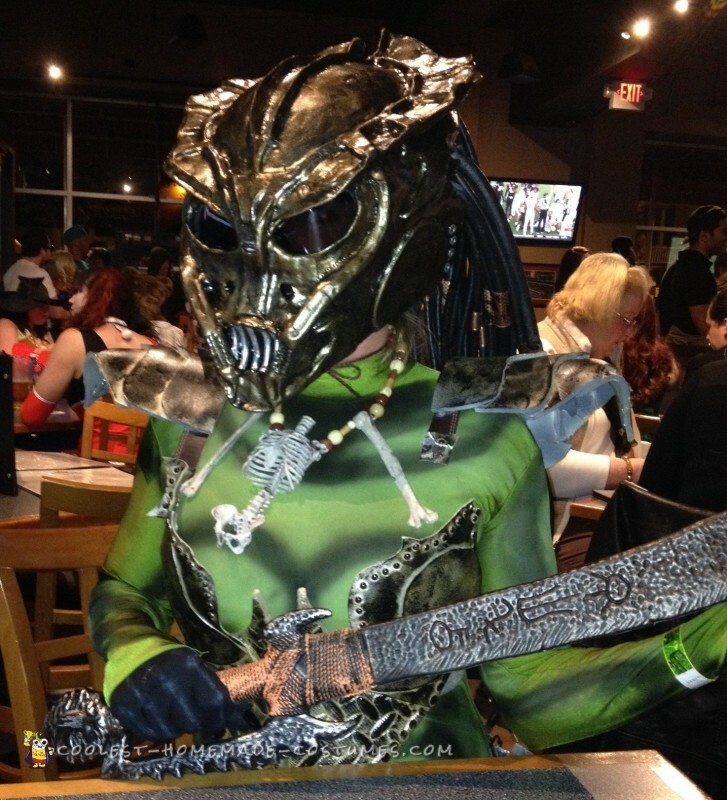 I loved the movie “Predator” and wanted to be something unique this year and not like a lot of other costumes. 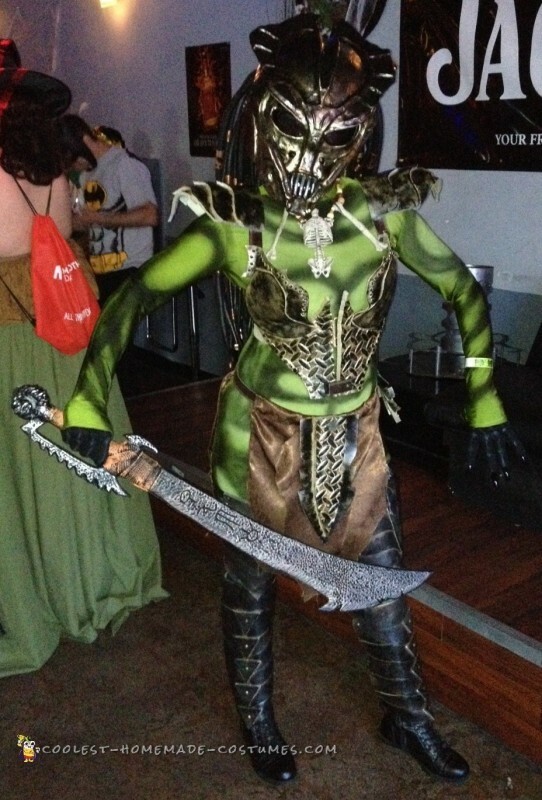 I definitely was the ONLY one who had a Predator costume and being female made it all the rave. Below you will read how I created this female Predator costume, what materials I used and pics. The most time consuming part was figuring out how to create and where to even start. Thanks to YouTube and watching many, many videos I began the process. #1: Helmet Outline: For the helmet I started with a simple skateboard helmet I found at Goodwill, I traced an outline of the facial mask onto scrap cardboard then cut out and shaped. It did take several small pieces of cardboard to get the shape I desired, I taped them all together with masking tape and hot glued the cardboard mask to my helmet. Doesn’t have to be pretty at this point because in step 2 you will find out what I did. #2: Molding Clay: After completing step #1, I bought white molding clay from the craft store and molded clay around the whole helmet and mask. With clay you can build up certain designs and carve out crevasses to make the mask look real. You let it dry for 24-48 hours then lightly sand the rough areas. Once dry, I spray painted primer all over and let dry, then sprayed black gloss paint all over and let dry. I then took a small sponge and dipped in gold paint and dabbed it all over the helmet to give it a worn/brushed metal look. #3 Dreads: I used backer rod foam I bought online ($8 for 200 ft), heated the ends slightly over the stove and rolled to get a point at the bottom of dread. I then brushed on black plasti-dip to each dread to give it a little weight; if you do not give weight to them they will stick out and look funny. After the dip dried (30 min), I took copper fittings I found at hardware store and crimped them on the pointed end of dreads to give additional weight. I then super glued them to the helmet. #4 Body Armor: I created the armor out of craft foam, shaping and molding by heating and jewelry wire to get the look desired. I then hot glued the small pieces together to create a larger piece. I then spray painted them all gold metallic (1 coat), then dabbed black paint with foam sponge to get a metal look. #5: Body Suit: You can create a suit on your bare body by airbrushing muscle design on it, but I opted to purchase a full suit to wear as it was a little chilly. I airbrushed designs on it but most of the design was covered up by my armor. #6 Skirt: I created the skirt out of brown velvety curtains I found on clearance, cut and hot glued to the shape I wanted and attached it to an old leather belt I had.